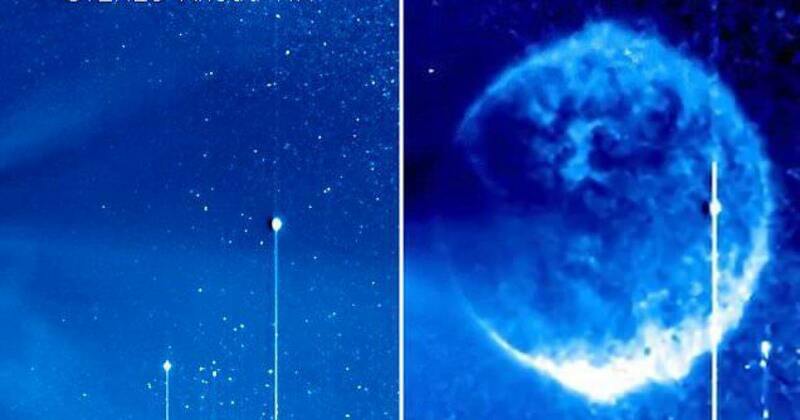 Scientists and conspiracy theorists across the world have been left stunned after Nasa cameras picked up a mysterious blue sphere moving in front of the Sun. Facebook user Pamela Jonhson, who lives in Mexico, shared the images from a link to Nasa’s website, claiming the Sun reacted to the object. The images, taken from Nasa’s STEREO satellites which orbit the Sun, show the large spectacle in clear view – before it goes missing from other frames. Pamela Johnson claims the Sun started reacting to the object on November 15, and there are several frames from the feed missing throughout the following days. The images left internet users divided as to whether or not this was anything exceptional. A YouTube account named mrfaithandphysics said: ‘It certainly does look exceptional and I’m stumped. Another, mrreg II, added: ‘I have downloaded the images from SECCHI HI1 and this is strange. This ‘anomaly’ can only be seen on images from 11.17, but there are missing several both before and after its appearance.